If there’s one criticism I hear from both my professional critiquers as well as my local writers’ group, it’s that I need to be more descriptive in Ms. Dee Ann Meets Murder. What does Baby Heather look like? How about Dee Ann? Where is Narrow Creek, Dee Ann’s new hometown? Describe the ladies at the Junior Woman’s Club. I get it. Evidently description is not my strength. Maybe it has to do with my journalism background. I write columns that are roughly 525 words, and when I have a story to tell, I can’t use up 100 words describing something or somebody. I have to get on with it. I think my skimpy descriptive writing has to do with my personal preference too. When I’m reading a novel, I sometimes find myself zoning out on descriptive passages. Even if they’re well-written, I may scan them, ready to move on to what happens next in the story. I’m all about the plot. But I realize I do need to draw a mental picture for readers. They may want some idea of what my characters look like, the clothes they wear, the places they inhabit, the food they eat, etc. etc. So now in revising Ms. Dee Ann Meets Murder for the umpteenth time, I’m paying more attention to descriptive details. And I’ve found what I think is a useful shorthand to help me with some of the main characters. For example, Heather has a blonde sprig of hair and big blue eyes and she looks like THE GERBER BABY. Dee Ann gets the wildly curly, Olivia Newton John Grease hairstyle and the beautician comments that she looks like SANDY IN GREASE. 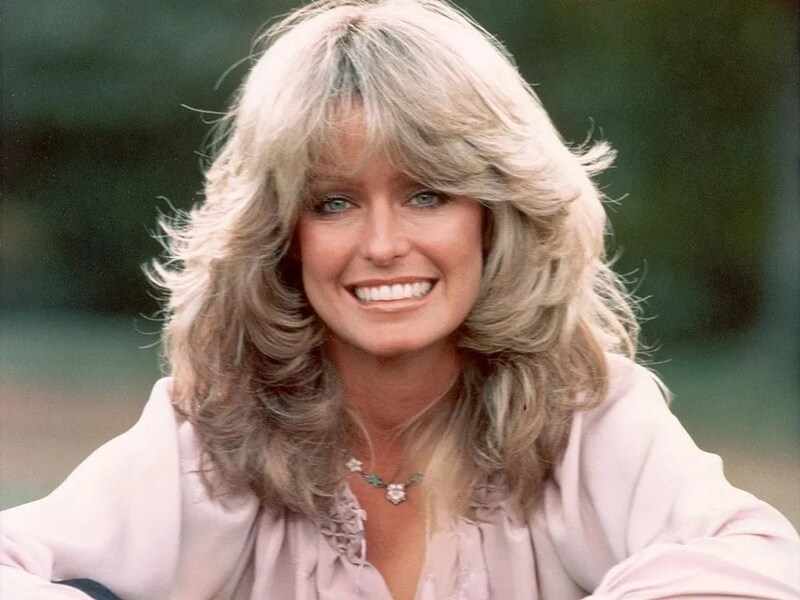 Joe’s boss’ wife and Dee Ann’s adversary Cynthia, is a FARRAH FAWCETT lookalike. A reference–dare I call it an allusion–is worth a thousand words, don’t you think?